All right, mine. This is from Book 2 of The Wildblood Series, and yes, I really need to get it a name. Due out in December. “Are you breaking up Team Three?” Taylor asked, not caring that Wade was getting tired of the question by now. I’ve got no spiffy graphic for today, so here’s a link to my website. 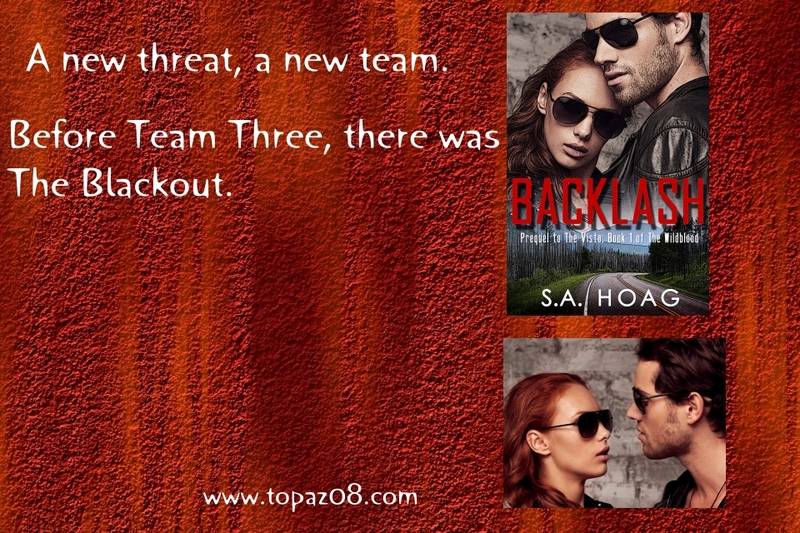 You can find both books, The Vista and Backlash, there, in all the available formats. Ahhh, another weekend, another chance to evaluate that I haven’t written nearly as many words this week as I wish I had. There’s always next week. Before I get to my 8, here’s the blog that’s made it all possible. Check it out for more fun snippets. Now, a bit of Book 2 of The Wildblood series. “The other air burst were east and south, one directly over downtown Denver and the third, the airport. All happened within five or six minutes.” He’d been in charge of Estes Park a few years, having moved north for a more secured city as his base of operations. The southern sections were troublesome. Several towns were under his jurisdiction, but there was a large and empty landscape where Denver used to be. The camera moved as he’d indicated, east, then south, lingering on each a full minute. “Got it,” Green leaned over her shoulder, watching the feed. Their radiation monitor hadn’t ticked up and that had been his main concern. The boundary went from normal readings to dangerous ones in the space of a few miles. By air, those miles went by very quickly. Well, that ended up being 10. Pretty soon, there’ll be some romance! No, really. Here’s the promos for the prequel & The Vista (Book 1). Give ’em a read, let me know what you think! Backlash is 99 cents always. Both those go to Amazon; if you prefer other book sellers, you can find them all on my website. I thought I’d post a few relevant things about guns. No, I didn’t know all of these and a couple I had to check on. The internet is a cool research engine. The characters in my first series (The Wildblood) carry a lot of weaponry. Hell, there’s been the mention of artillery, which I know nothing about other than it’s loud. So, here’s a few things I’ve noticed over the years. I hope this will help if you’re writing characters with guns. At no time should a real gun be used as a toy or thought of as anything other than a potentially deadly piece of equipment. Now on to fiction. I learned to shoot when I was 6 (a .22 rifle with blanks), so I’ve been around various weapons always. Note – I don’t pretend to be an expert on any firearm. If you need exacting details, please use the internet and look it up. The NSA won’t visit – or at least, they haven’t dropped by my place, so far. If they do, I’ll offer to send them a copy of my book! All right, let’s see what’s next. Guns are loud. Even little guns are very noisy and large guns can literally make you deaf. The person getting shot at gets a louder report than the person shooting. Also, silencers? No. They don’t ‘silence’ a gun, they merely make it a little less loud. (They are also illegal in the US.) In the middle of a shoot-out, or whatever your character is involved in, they may not notice their ears are ringing. Later, they may be temporarily deaf. Picture above – This is a revolver, a Ruger .357 to be precise. Revolvers don’t have a safety. Guns run out of bullets. Revolvers generally carry 6 rounds. Magazines for semi-autos can hold 16 (Glock). No one in their right mind runs out of bullets then throws the empty gun at their target. Why oh why would they? There’s always a chance to reload. An old military saying comes to mind – If you’re not shooting, you should be loading; if you’re not loading you should be moving; if you’re not moving, you’re dead. Another is – cheat if necessary. Someone that carries a gun doesn’t tell people this fact. If your semi-automatic pistol runs out of bullets, the slide pops open and stays there. You know it’s empty, you don’t have to guess. So does the person you’re shooting at. Never let someone get close enough to grab you. Above picture is a Beretta Police Special 9MM – and it’s empty. Semi-auto means you can fire quickly by repeatedly pulling the trigger quickly. Auto means if you keep the trigger pulled, it will keep firing. Which brings up . . .
Recoil. The bigger the gun, the more ‘kick’ it will have. A .357 can jump right out of the hands of someone not prepared for that. Same for any firearm. If your character is shooting a sniper rifle, (s)he would use a bipod, a tripod or something to support it and be leaning against something or lying on the ground. Sniper rifles are heavy; ammo for sniper rifles is heavy. The recoil from these is serious. The recoil from an automatic is going to make your aim crap. You see what I’m saying. If your character has never used a gun before, don’t expect they will be able to hit what they want to the first time they shoot. Guns need calibrated so they are accurate. People need to become familiar with a particular gun in order to shoot it accurately. Pick it up in the heat of whatever, for the first time and your character likely won’t know if it’s loaded, how to reload it, or how to make it go ‘bang’, let lone hit their target. Never ever ever have a character put a handgun in his/her waistband when they aren’t using it. Guns are heavy, even little ones. It would fall out or down the pants, which makes the character look inept at best. Also, dropping a gun won’t make it go off. Holding a gun sideways is just for movies. You can’t aim, and let’s just admit it, you look pretty silly. Walls, tables and car doors don’t stop bullets. There are many types of bullets, but these things don’t stop any of them. There is no such thing as a gun that can pass through a metal detector, undetected. No plastic guns, no ceramic guns, no paper guns. In a future setting, this may not be true. It’s your world, invent a plastic gun, but explain why it doesn’t explode when a round is fired. Unless you are firing tracer rounds, you can’t see bullets flying away from guns. Bullets don’t spark when they hit things. Nor can you make their trajectory curve. Again, movie stuff not facts. No one can tell the caliber of a gun by looking at a bullet wound or a hole in a target. Some different calibers are really close too the same. Forensics can tell, but not standing around on a street corner. And finally, people that carry guns very seldom have to actually use them, at least in Real Life. People that own guns aren’t anti-social loons, out to do damage. If you’re writing a book, this may or may not be a fact as well. I’m sure I’ve missed things. Ask me and I’ll tell you what I know. And now, a plug for my books. Backlash is only 99¢ now! All retailers. Team Three is The Vista’s top security officers. They are children of the last generation pre-World War 3, and they are different. It’s a secret they struggle to contain. Problem is – there’s something dangerous out there, just beyond The Vista, watching them. The Vista: Book 1 of The Wildblood series takes place in the near-future where the Earth has been mostly emptied of human beings by a short and devastating world war. Venturing beyond the safety of their valley may be the best move Security has ever made; it’s absolutely the most dangerous. WeWriWa #8Sunday – Sneak Peek at Book 2! I missed a couple weekends, sorry about that. Sometimes I wake up and think “Today is what?”. So today, I’m going to give you a peek at Book 2 of The Wildblood series. It’s a WIP and I hope to have it out in December. Please keep your fingers crossed for my ambitiousness with this project! Oh, this! I love the tasty snippets you can find here. My 8. The setting is near the Rocky Flats Nuclear Weapons Plant. ‘Nuff said. Standing nearby, Green waited, while Vance walked up and down the blacktop, never more than a few yards, stopping to check his watch occasionally. Just as he was about to tell her ten minutes was nearly up, she stood, slapping her hands together to dust them off. Promos now. 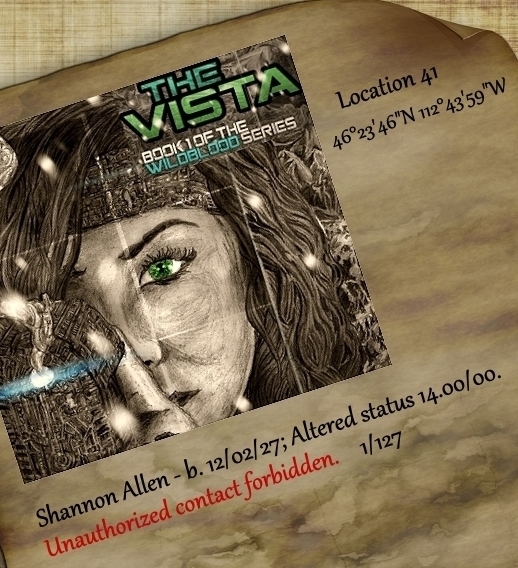 The new one for The Vista has some information not previously disclosed. Also, Backlash is now and permanently at 99¢ everywhere. The links on the graphics above go to Amazon. If you’d like a different format, the graphic below goes to my site and all the different places both books are available. Book 2 – Grand Master! No, not my Book 2, not for months. But Aurora Springer has given us another Grand Master book, Grand Master’s Game! I’m almost finished with the first (Grand Master’s Pawn), so I’m very excited and I’m sure she is too. Here’s the details. The hiss of air alerted Violet. Rotating towards the sound, she saw the air-locked door to the next section of the ring slide aside. Massive creatures bounded through the door. Twice the size of a man, they were a nightmare cross of spider and wasp with eight legs, stubby wings, yellow and black stripes, and huge mandibles like a pair of scythes. They were inhumanly fast. One hurtled straight at Violet, jaws open like giant scissors. The giant striped spider leaped at Violet and she dodged aside. Too late! Her attacker jammed her neck in its pincers and dragged her off her feet. She swung from its mandibles, her hands and feet struggling for purchase on its hard shell. One small part of her mind wondered how she could still breathe. The rest of her brain searched for an escape. In the background, the yells, screams, thudding blows, and the muffled boom of an explosion told of her companions’ battles. An acid odor filled the air and the enormous head loomed over her face, six giant eyes next to hers. Energized by terror, Violet grabbed hold of one pincer and scraped her fingers across the nearest eyes. She’d hit a sensitive spot. The spider-wasp jerked violently, flinging Violet’s body from side to side. Her legs thumped on the floor. Biting back the pain, she clawed at another eye and twisted her legs, bracing her knees against the base of its fore limbs. The jaws held firm on her neck. She was stuck. Aurora has published science fiction romances in two series, two novellas and short stories. Her first series, Atrapako on Eden, describes the interactions of humans on the terraformed planet of Eden with scaled aliens from the hostile planet of Vkani. She has published two books in this series: The Lady is Blue and Dragons of Vkani. Her second series is Grand Master’s Trilogy. Book 1, Grand Master’s Pawn, was published in March 2015. 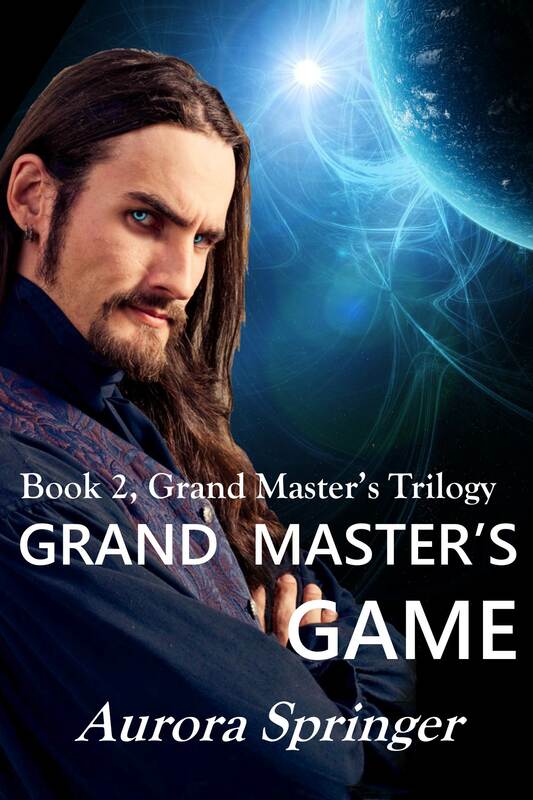 Book 2, Grand Master’s Game, is available for pre-order and release on July 17th. Her short story, Gifts of Jangalore, is set in the Grand Masters’ Universe. Her standalone novellas are: A Tale of Two Colonies and Captured by the Hawk.